I fell in love with art, science, and music at a young age. I always felt a bit different, especially, when I lived in the more conservative sections of the South, but at eleven I felt less out of place when I found skateboarding. At sixteen, I started writing my own music. In college, I majored in music, but in my sixth semester, I decided to change my major to geology. I played in a few bands, worked, skated, made art, and went to school while studying geology. I graduated with a degree in geology then I worked for an environmental engineering group before returning to graduate school to study Structural Geology and Tectonics. After I finished grad school, I moved to western North Carolina where some of my family are from, and began teaching Geology at Western Carolina University and at a community college in Asheville. That is when I started a daily Ashtanga vinyasa practice. Not sure there was a “before yoga.” Yoga is always there. I am still trying to find it. How did you find the practice? I had gone to a couple of yoga classes as an undergrad in college, but the instructor was into new age stuff, and seemed to be just making most of it up as she went along. From those experiences I ended up thinking yoga practice was mostly like that, just rolling around on the floor visualizing balls of energy floating out of my abdomen, so every time someone would mention yoga I would laugh a little. After I moved to Asheville, I met someone, and they thought yoga would help some of my skateboarding maladies. She taught me the sun salutations and a bit of the standing by a quiet mountain stream. I resisted though. I was always too busy. It wasn’t until I had been practicing off and on for around six months, and had gotten into an auto accident, that I got hooked. No one was really injured, but there was this lady yelling at the police officer and I. However, rather than doing my normal thing by trying to prove her wrong or yelling back, I just listened and breathed gently with sound. Later that week, I thought back on it and saw how it could have gone down so much differently. I found I was paying closer attention at other times too, and how I sighed less and thought more clearly because of the practice. With my background in science and spirituality (in part because my father was a Lutheran minister), I found myself looking for ways to reconcile the physical and spiritual. Also, because I had been a skateboarder for so long, and had seen so many physically amazing things, I became mostly interested in the spiritual and was less intrigued by the shapes and forms. Ashtanga and Buddhist principles offered to me a way to help marry the physical and spiritual, and served as a means to help me listen, pay closer attention, and love more. That got me hooked. 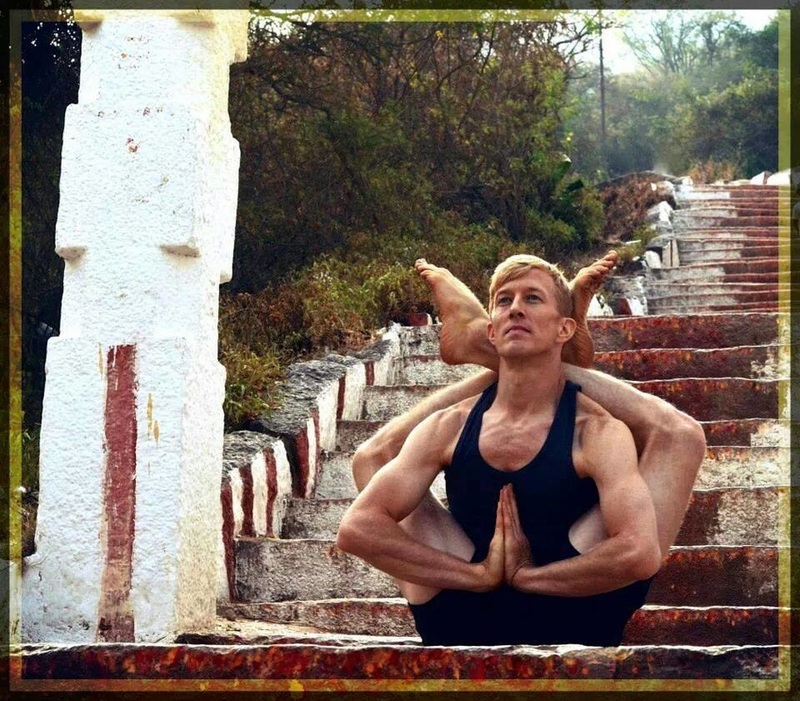 Can you speak about your experiences in Mysore and practicing with your teacher, Sharath? The first time I went to Mysore, India, I had no idea what was going on. I had been practicing Ashtanga a year with various teachers in the States and just showed up. I met Guruji and registered. There was no application or letter sending at that time. Guruji was not well, though. Guruji would sit in the chair on the stage while Sharath was running around calling and moving bodies. I can remember sitting in the purgatory waiting room and hearing the breathing and seeing bodies suffering and sweating, and hearing Sharath or Guruji yelling “one more” felt like we were being called to slaughter. It seemed like the shala itself was breathing. I was so nervous, by the time I rolled my mat out I was nearly shaking. It seemed so big and intense. For five weeks I did primary and didn’t get an adjustment or any comment. 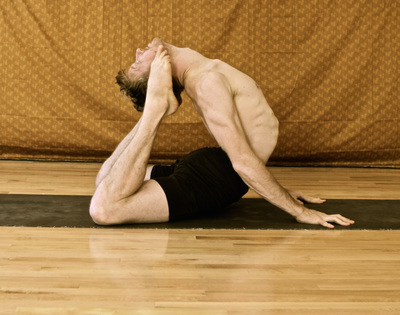 Then one day, Sharath came over to me while I was doing urdhva dhanurasana and said “John, stand up!” so I tried. Up till that point I had tried on my own, but I couldn’t come close. He, however, must have been watching like a master gardener watches vegetables ripening, and knew that I was ready. I trusted him and somehow managed to come up. From that experience and the many other times I saw that he was keen to get me to do things I didn’t know I could do at just the right time. I have been to Mysore seven times and there are so many sweet things to say about my teachers, but its probably best to convey the rest of them in person. What are your thoughts on the student-teacher relationship? How does surrendering play a part in this process? All three, Tapas, Svadhyaya, and Isvara Pranidhana are really important. Most traditions often emphasize one over another, but, since we are apparently in the world where everything is in action (kriya yoga) we have to use all three. Surrender (ishvara pranidhana) is hard to do without tapas and svadhyaya and it alone won’t cut it. If I roll out my mat, and just surrender to some higher power that won’t always work to make us happier and useful to the world. It seems most times for me the three have to be there (kinda like satellite triangulation). I have to work, study, and surrender also. For me the practice is about learning the art of transformation, and how to prove yourself wrong on what seems to be a daily basis. It starts with a teacher telling you something like, “You can touch your toes”. You insist, “I cannot,” then, a few weeks go by and with regular practice “you do”. Then perhaps later they say “catch”, a few more weeks or months go by and with regular practice “you do”. It goes on and on, and after a few years of this stuff you just start to believe that it works out better sometimes just to look and see what might happen without doubting straight away what is possible. That even just rolling the mat out when you may be in your darkest hour or injured may have unexpected benefits. A teacher that is good for you knows when to say “try so and so” because they have seen so many things ripen on so many bodies before you. They know the signs to look for and, most importantly, they care for all. It is so important to seek someone that can do that. It takes time though and this is usually more time than we are willing to put in. Whatever fruits there may be available your teacher can only say “try” or “mmm stand up!” Svadhyaya is important. If you want to taste a coconut fresh from the tree a teacher can tell you where a grove is, how to climb, but they can’t climb and taste it for you— that you have to experience on your own. For me, surrender, the questioning (svadhyaya), and wrestling (tapas) are a coexistent part of the practice. When your teacher tells you something you don’t know or don’t understand, it’s nice to listen, and then not to just blindly surrender, but to question and wrestle. Revisit their reasoning with patience and experience. John, can you talk about when the physical transformations aren't progressing but declining? It’s our natural human inclination to desire progression. How should one shift perspective during this period of injury or natural aging? I hope I never stop practicing, but, what I practice will change. Hopefully, the yoga practice just goes more internal. For most of us we start out at the gross. As we age we are lucky in some ways that we can start to hone in on the subtle. We all go through different periods of time with different degrees of discomfort/pain/declining. For example, when we put our legs in lotus the first time we may feel pain for a few seconds. We know, though, that perhaps the relief will come when we remove it from that position. Although we feel momentary pain or discomfort, because we know it will soon be relieved, it does not require much to face it. Then, there is pain that lasts for weeks or months which challenges us more and requires a bit more of us. There is pain, still though, that sometimes lasts for years and years. This longer-term type or declining pain though a challenge is an obstacle worth facing, and how we face it is important. 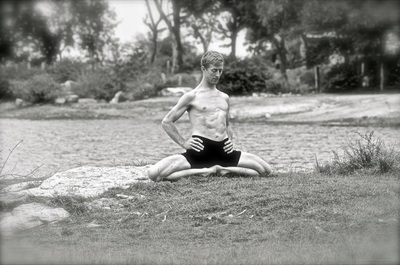 Progressing or not progressing with asana was perhaps never the point. It seems more about how we face those ups and downs (YS 4.29). The overnight lows and daytime highs we get used to, but the longer the duration of the hard spell the more we doubt. If it’s a high, the ego balloons. If it’s a low, the ego deflates. The shift of perspective is to become less attached to those highs or lows (BG 6.7) so that we may conquer the mind. How have you integrated your Buddhist and Ashtanga practices? Prioritizing is important; perhaps this is why ahimsa is rule #1 for both. Though, regarding the rest of Ashtanga sadhana and other practices, you have to use the ones that are working best. If you are lucky as I have sometimes been, you have a teacher there to help guide you. I have gotten so many practices (Buddhist, Vedanta, Christian, etc.). Most of them are to be done daily, but If I were to do all the practices that were daily assigned starting now without stopping, it would likely take me a month without repetition. I can’t always tell which ones are working (making me kinder, happier, and giving me and others long term happiness). Sometimes you think you are happy and doing well and you look back and see some suffering was hidden. Mostly, I just go by how I look in photos from year to year or how willing my family is willing to tolerate me. The Buddhist and Ashtanga practices don’t really oppose each other too much in my mind, and there are many Buddhist themes in the Yoga Sutras. They both seem to be working from the gross to the subtle. They both include relative and ultimate truth. To be sure, there are some differences we could wax on and on about though. The Tibetan Buddhists generally practice inner methods first (meditate or work more on the mind), then the asana, and certainly pranayama comes later. Tapas is there, but it is more of a mentally oriented one. In my earlier days of the practice, I sat and tried to meditate for an hour or so for several years. Mostly these days I chant every morning, do the pranayama, japa, and will try to mediate only 10-20 minutes. The time I used to spend checking out usually in meditation is for me better spent checking in by taking inventory of how I am keeping the yamas/niyamas/vows. Through the years, I have found that what Sharath and Guruji indicated regarding asana coming first before coming to meditate seems to work better for my mind (YS 2.49). It is kinda like trying to meditate in a busy New York street (my current state of mind, and perhaps before I started asana it was more like a New Delhi street) versus trying to meditate after practicing for years and years— the mind becomes cleaner and more like a temple, and it is easier to focus (YS 3.1-3). Like a fruit tree, the first four limbs you nourish, and, then, the last four come more naturally and perhaps bear fruit. Most of us want to go straight to Samadhi though. We want to go to the market (meditation retreat), buy the fruit, and tape it on our tree then say to others and ourselves, “Hey, look at the fruit I grew”, but we don’t want to take the time to water and nurture the plant with the first four limbs. Especially, it seems, we often neglect the first two limbs (yama & niyama). I think the Gerhanda and Siva Samhita say there are two main forces: internal and external (vikshepa and avarana). It seems we mostly look outside for help these days. The practice though calls us not to look out but in towards our own problems. I usually don’t like looking in. It is uncomfortable and scary. It is like listening to your own breath during practice, showing ourselves, our teacher, and neighbors our struggles. I try to avoid this looking in in so many ways. This is why a teacher is useful for me. What does parampara mean to you and how has Sharath affected or guided your path? I came to the practice and eventually to teach, but mostly it wasn’t something I wanted. It was in me (like coming up from back-bending), but seeing that spark and fanning the flames came from my teachers and from forces greater than me. So many times in the beginning I tried to stop practicing, but many things pushed me back on track. I became somewhat convinced there were forces conspiring to get me to practice and then eventually to teach. I had even at one point listed over eighteen conspirators and peculiar events. I started practicing with John Campbell at Pure Yoga East in 2008 (before he moved to Pure West). There was a flyer saying a certified teacher, with a PhD from Columbia in Buddhist studies, and a wife and three kids teaching there. I was there taking a Buddhist course intensive, and I remember seeing it and thinking this guy sounds inspiring. I was especially excited because I hadn’t met many Tibetan Buddhist Ashtangi sadikhas at that point. So I went the next day and there were three people there. I was really lucky. I was only there for a week but knew I wanted to go back. The next year another certified teacher started me on third series postures, but I didn’t feel quite right with it and I wanted to get back to the Mysore Shala. However, because I mostly only had the summers off with my job, and as the Mysore Shala was rarely open in the summer, I thought I had better find a good teacher in the US, but still wanted to keep Sharath as my main teacher. So I made it a point to study with John Campbell whenever I could. In 2010, Sharath was in NYC teaching. Sonia Jones and John Campbell spoke afterward and John Campbell said, wouldn’t it be great to have more intensive yoga studies in a university. Something that included the physical but was also grounded in study. The next day Sonia called John Campbell out of the blue and said she had just donated a large sum to the University of Virginia to start a yoga studies program there. I had been assisting John Campbell for a couple years up there, then, one day while walking on Broadway Ave, he said he wanted me to run this Mysore program at the University of Virginia. However, I told him that I had a job and couldn’t commit. Nearly a year passed. I went to north India, then again to Mysore when the shala was less full (it is hard to believe only four years ago there was such a thing). I was having a crisis because I was not sure if I was ready to move to Virginia as John Campbell had mentioned, or if I should stay in Asheville. It was three weeks before the start of the semester and I had 150 students signed up to take my geology classes when Sharath said to me, “John, come to my office.” I thought I was in trouble. Then, Sharath said he wanted to authorize me and that he wanted for me to run the Mysore program at the University of Virginia and that next month I should assist. I quit my Geology Instructor job the next day, assisted Sharath, taught a led class at the Mysore shala, and moved to Virginia to start a brand new program at the University. It has been amazing ever since. But with that said, I still doubt often. I doubt if I should be doing this, if my parents are ok with it, if society thinks a male from the South should be doing this but, my faith in my teachers helped a lot. At the time, I was perfectly happy to just be a geology instructor at a really nice community college with colleagues and students that I loved. I had a great job, and a sweet bungalow house I renovated in utopian Asheville, NC. There were family, friends, good food, yoga, Buddhism, etc. I was happy (and still am) to be a student, but my teachers thought I should teach some too. When John Campbell and then Sri Sharath-ji asked me to teach at the University of Virginia, I felt a lot of pressure. I felt I was tearing open in a way, tearing away from twelve years of financial and mental investment in geology and utopian happiness. I don’t want to sound dramatic, because it really wasn’t a bad thing, but it was something in me that I had a hard time letting go of. Now, though, that I have seen students’ lives changed and so many happy times, and am able to study the teachings that help me create lasting happiness, I couldn’t ask for anything more. So to get to your question, Parampara is about passing some of the light your teacher gave. It is also though sometimes about sacrificing some of the candle, and sometimes even burning it at both ends. Now that you’ve been running the Mysore program at the University of Virginia, what reflections do you have on the role of yoga in a student’s pursuit of academic studies? What are the unique challenges and qualities of running a Mysore program in a university setting? My experience and so many of the students I have spoken with say that the practice helps them to be more receptive and more able to concentrate. There have been a few scientific studies that say the same, however, we are still lacking in data and research. There are so many possibilities in yoga researching, particularly in the repeatable experiment of Ashtanga vinyasa yoga and they will come in time. I honestly sometimes look at some of my younger students and wish I had the practice when I was younger so that I perhaps could have been more receptive and able to concentrate, but my mind was not in the right place to take it. The practice came to me at the exact time and place it was supposed to, and I am so grateful it did. For the universities, and in the world in general, there are old forces and ideas at play. I can remember when I was a kid I had never heard of a vegetarian, there were not really any vegetarian items on the menu; it wasn’t a topic of discussion really. Now when you go to many or most towns (depending on your region) you can find vegetarian items, vegan/vegetarian restaurants. I believe one day we will look back at the way we have been consuming meat and the environment it destroys, in the way we look back with embarrassment about slavery, misogyny, etc. Conscious consuming is coming. We are not neanderthals anymore. We can use our higher cognitive powers to create and enjoy our food. This is beautiful. In the same way, I hope one day talking about yoga research in universities will be normal. Yoga will spread to universities. It is funny, there are apparently over 25 million people practicing yoga in the United States, you would think that since universities seem keen to make money they would take charge and start offering trainings, do research, etc. However, there are few available and equipped to share the intensive side which is really yoga. As Sharath said before with the Swami that almost drowned his student ‘the thirst has to be there’ so those of us that desire to be sadikas (practitioners) have to do it. We have to study like Guruji did. We have to learn anatomy and apply it to yoga, or business, or Sanskrit. This intensive study side to yoga is parampara (T. Krisnmacharya, Guruji, Sharath). Otherwise; it is just sport, or stretching, as so many want to see it. Of course, It can be just that too, and often is, and that is ok, but for those of us that have that thirst, we have to dig deeper. When we do action most of us lean one way or the other. We do either more tapas or more svadhyaya (YS 2.1). We have to do both. We plow the field but also learn about the best season and seeds to plant then, we surrender and hope that the greater forces will do their work (ishvara pranidhana). Svadhyaya is important. If your dharma is to be a pilot, then you practice and you spend 1-2 hours studying something relating to being a pilot. If you are a yoga teacher, for example, you should spend 1-2 hours studying the shastras/scripture/philosophy. The university students, both young and older, are supple and are in a right place and time to bend their minds and bodies. This may be, perhaps, because the process of education (especially Liberal Arts education) demands that you get outside your box and try something. I have been so very lucky to have the best students in the world, in a program that has grown to more than fifty in the last two and a half years. It is amazing, and an honor to hold a great space with great students and share the little bits of nectar I have gotten from my teachers. I am excited to see what the future holds. Any advice for the home practitioner, diligently practicing each morning as best they can without a teacher? Think what your teacher would want. That teacher is external and internal, and yet, they are not separate. Better to practice with a teacher as all the knots (gruntis) are pierced with them. So if you aren’t around them, but have practiced with them for years you can probably guess what would be the best decision. If you never had a teacher, you might want to consider giving it a whirl. When I started, my friend was my teacher. Then I had a local yoga person teach me, then I went to Sharath, and then to so many people across the US. I settled back in with Sharath, but I still value some of the perspectives of the traveling teachers. Most of that time, though, I did not and still do not have access to an external teacher. Most of us that teach this practice for approximately ten months a year, we don’t have access, and the couple months we may be in Mysore we barely can ask so many questions. So often I think what both teachers internal and external, would want. · Buddha – remember those that have practiced before you, how many struggles they must have faced and how sweet and flexible (mental and physically) they have become. · Dharma – read, study, and check in. I have seen those that kept vows and stayed on the path (monks and lay persons) that have been changed by being good practitioners. · Sangha - Try to practice with others anytime you can. It is way more fun to share. · Try to keep the same routine. I have been traveling a bit lately so this is harder. If you are traveling don’t procrastinate. If you have two hours in the Moscow airport, do five sun salutations. If you are camping in New England, and can’t find a spot to practice take ye to the gazebo. Who cares if the locals think you’re weird! · Remember: When I practice I am happy I did, but when I have skipped I am always not so happy. When I was a kid, I hated brushing my teeth. I went to the dentist. They would say, “Are you brushing twice a day?” I was not. Then, as I got older, I realized that it wasn’t that big a deal. That I liked the way it felt to have clean teeth. The practice is like that. Even if you just do five sun salutations you are stoked and I always feel a bit better. I have to remember that. · You can record yourself. I’m not saying put it on Youtube or Facebook but just to see. Most of us know what much of the stuff should look like, and, if not, you can find it on the internet and should so you at least have that knowledge. · Do a once a week led class. If you don’t have the ability to go to a teacher that knows the count then use Youtube. I have done online led classes like this at least once a week for years now and while it is no substitute it can sometimes help if you are having a hard time. The led class is important. Plus, it’s fun to imagine you have a speedo on and are practicing next to Richard, Maty, Chuck, Tim, Eddie or some other cool yoga dude. · Set your intention before you practice. That prayer in the beginning is a nice way, but if it has lost its loving feeling just think for example, “I want my mom to be healthy and happy,” or “I want to end all suffering in the world.” The thought, however big or small, is helpful, and is the practice. · Try to be as aware as you can for the first sun salutations. These set the tone for the rest. · You can be a fundamentalist, but it probably won’t work out that well for you or others. If, for example, my teacher says to practice even while I am sick with, say, a cold, if I try a few slow sun salutations and I feel better after a few, then I see what I can practice, if not, I go back to bed and don’t beat myself up about it. · Keep track of how you are doing with the practice – particularly, how you may be keeping/breaking the yamas and niyamas. I kept a small journal for a few years of these and other buddhist vows. This is a nice exercise to check in and change some of our patterning. Anyway, here are a few, I will probably think of some more after this interview is over. · I also like to keep a picture of my teacher to help remind me of cool things they said or did. Anything nice I said came from my teachers, and anything I said that was dumb came from me and my ignorance, so please have patience with me while I am still practicing.